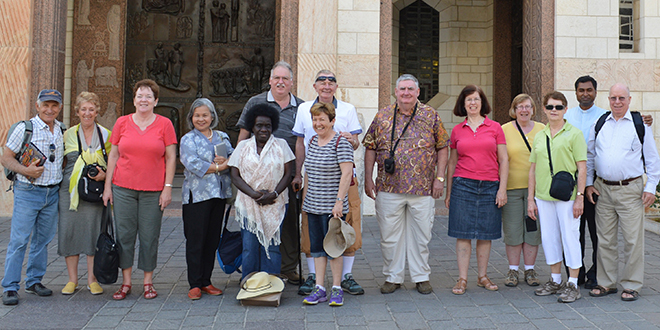 Blessed time: Brisbane pilgrims relished their Holy Land visit last year. Brisbane Carmelite of Mary Immaculate Father Paul Chackanikunnel will lead a pilgrimage to the Holy Land in October. He writes of “the moving experience” of leading a similar pilgrimage late last year. PILGRIMS in last September’s trip to the Holy Land considered it a blessing to visit places where Jesus was born, lived, died and was resurrected. He was not only a hero of that time, but was also the Son of God who humbled himself and became a man like one of us. The pilgrimage comprised Hendra/Northgate parishioners as well as members of several adjoining parishes. Though some of our members had been to the Holy Land before, they still wanted to revisit because of a certain strong attraction to this place. After all, since childhood we have read and heard the gospels, and have imagined what Israel would look like mainly from Bible stories and illustrations. The Holy Land landscape is nothing like the Australian landscape. It is very hilly and beautiful. The weather can be very hot or cold and dry as the season changes. We visited Caesarea, where Herod’s summer palace was and then to Haifa where St Paul left on his final voyage to Rome. Then we moved on to Nazareth, where Jesus lived with Joseph and Mary, and Cana, where he performed his first miracle. The couples in our group renewed their marriage promises in the church at Cana, a really moving experience for all of them. Almost everyone in our group commented about their experience at Caesarea Philippi. At Caesarea Philippi, Jesus told Peter “you are the rock on which I am going to build my church and the gates of Hades will not overcome it” (Matthew 16:18). Now, as we all know, what stands is only Jesus’ church, which is built on Peter, the rock. We spent a reasonable time at Capernaum, the main area of Jesus’ ministry. The boat journey across the Sea of Galilee was incredible. This was the sea where Jesus walked on water, where they had a miraculous catch of fish, where Jesus calmed the sea and wind, and the shore where Jesus appeared after his resurrection. Not only did our group visit Israel, we also went to Jordan and saw Mt Nebo, where Moses saw the Promised Land. While there we went to Petra and walked its streets. This magnificent site would take days to truly see its grandeur. While Galilee was relatively quiet, Jerusalem is a bustling city with roads going everywhere. Jerusalem is built on three hills and was very special to all. We felt as if we were so privileged to see and walk where Jesus walked, cured people, was crucified and resurrected. The highlight for our group was walking on the Via Dolorosa and following Jesus’ footsteps to the crucifixion at the place where the Church of the Holy Sepulchre now stands. This church has many chapels and shrines, and rising up from the basement is the broken stone that forms Golgotha, and nearby, the remains of the tomb. To sit and meditate in this church and think of what happened on this spot is hard to describe. The tour was full and there were more places visited that have not been previously mentioned, such as Masada, Beit She’an, National Museum, Bethlehem and the cave of Jesus’ birthplace, Meggido, Jericho, Dead Sea and Qumran, where the Dead Sea Scrolls were located. This land is beautiful but desolate in many areas. It has been fought over for many centuries and is still being fought over. There are ruins of great cities with walls there that still divide. The people are hospitable, however the Christian community is shrinking rapidly and they look forward to the support of fellow Christians. The pilgrimage brought the Gospel alive. To make our visit a profound experience, relevant passages from the scripture were read at all places where we visited, with Mass also celebrated at important places. 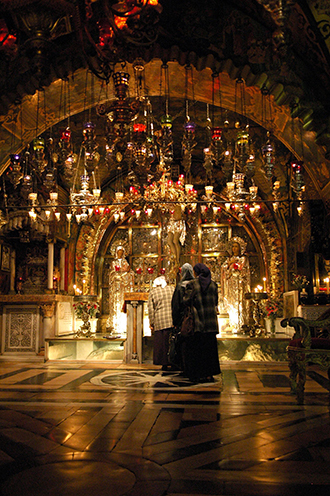 We would strongly encourage every Christian to make a pilgrimage to the Holy Land at least once in their lifetime. Since we cannot explain or borrow someone’s experience, each individual has to undergo the process of “experiencing” to understand the reality deeply. Another pilgrimage from Brisbane is being planned for October. The itinerary and cost will be available soon. To experience the Holy Land contact Fr Paul Chackanikunnel on 0428 624 287 or parish secretary Monica Johnson on 32683040 or hendra@bne.catholic.net.au. Travel agent Guido Canale of Canale Travel Service Lutwyche can also be contacted for details on (07) 3357 6444 or guido@canaletravel.com.au for information.